Fairness, and good journalism, you know, is getting both sides of a story, which the Jurassic Press has decided to not do unless it fits their Secularist agenda. From several sources I’ve tried to create a timeline of what happened, and why I think Goldstein is a liar, and the NY Times supported her. In this, I hope to provide something closer to the truth, doing journalism as I was trained to do, though I don’t have access to interview the players. They have become filled with every kind of wickedness, evil, greed, and depravity. They are full of envy, murder, strife, deceit, and malice. They are gossips, slanderers, God-haters, insolent, arrogant, and boastful; they invent ways of doing evil. 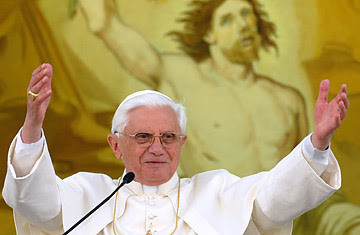 I fully understand the natural sense of responsibility of all sincere Catholics to defend Pope Benedict XVI and obviously what he represents. There are nevertheless too many authentic reported cases of such crimes, and too many reported cases of the Vatican's not responding as fully as would be expected, on being informed of them, to allow one to simply boil it all down to an orchestrated slur campaign. The responsibility of the Vatican in the world is enormous, and the Pope has already shown himself to be a devout and courageous man. The accumulation of evidence and charges against the Vatican for not having responded appropriately after receiving information regarding such crimes, seems to me to be too serious to ignore. Would it not be preferable that the Pope made some sort of declaration regarding this very serious issue to reassure all concerned, rather than eventually risk being legally obliged to justify certain decisions should inquiries ever lead to this? of the Vatican by practicing internal discipline limited to the Vatican's own constitution. But with the passage of time such an internal policy could transform itself into a license, a lasciapassare, which instead of punishing eclesiastic criminals, it might even give them the impression of being protected by the Vatican. Thus 'protected' they could assume the freedom of continuing to practice such 'tendencies'. If there is any truth in this, the Vatican itself would be an indirect complice.